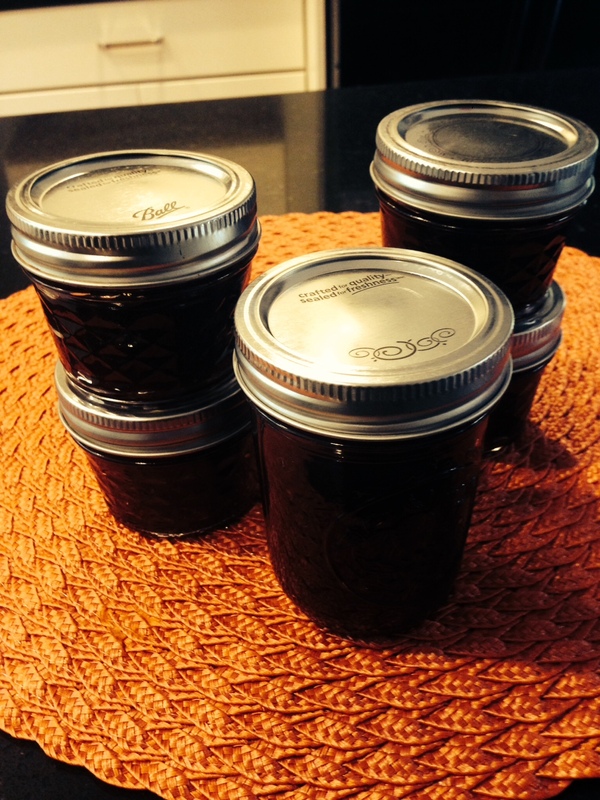 Plum preserves are one of my favorites! My plum harvest was much smaller this year. I’m sure the major pruning we last winter and the drought contributed to the smaller harvest. Thankfully, the fruit is still sweet and juicy like last year, and I still had enough to make preserves! The first time I made plum preserves I was shocked how much time I spent constantly stirring the boiling plums. I made the mistake of cooking to many plums at one time, and the bottom half-inch burnt so much it took days to scrub the pot. I had hope there was an easier way, because that experience almost kept me from trying again! My recipe doesn’t use much sugar because I love the “tart” taste of plums, but don’t worry it still tastes sweet! I also don’t use pectin, because I like the thicker, “preserve” consistency. I’ve included the amount of pectin to use if you prefer a more “jelly” like consistency. According to the Ball Complete Book of Home Preserving. Doesn’t that sound yummy? Plums do not need to be peeled before preserving, and that’s why I think they are one of the easiest fruits to preserve! 4 cups of chopped plums, usually 20-25 medium size plums of your choice, yields about 4 cups. My tree is a ‘Santa Rosa’ Japanese plum so that’s what I use. Wash plums, then roughly chop into nickel size pieces, discarding the pits as you chop. 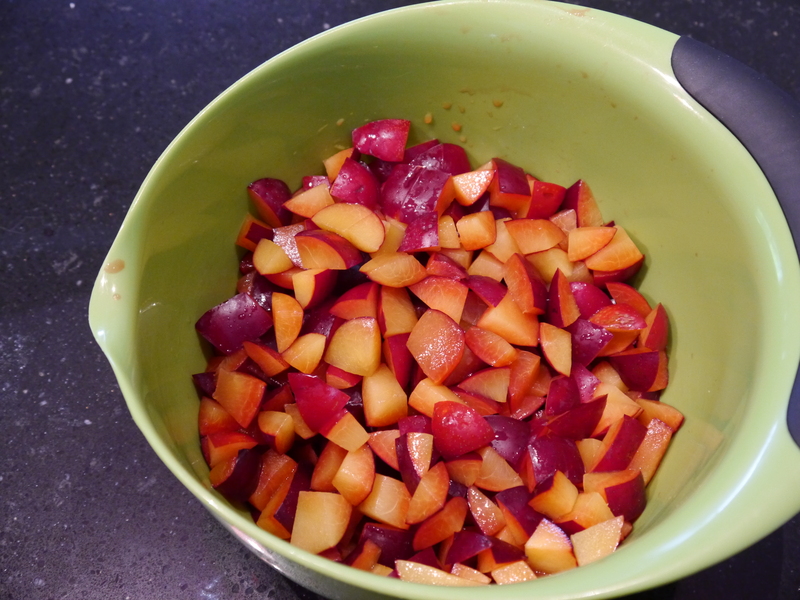 Transfer the chopped plums to a medium size bowl and use a potato or avocado masher to crush the plums. Be sure to have your canner, jars, and lids prepared. Here’s information on how to prepare your jars and lids. If you don’t have a canner you can refrigerate the preserves and eat within four weeks, or freeze them and eat within twelve months. I explain the freezer method later in the post, and also include instructions from Ball on the water bath canning method. Here’s what my plums looked like after being chopped and crushed. If using pectin, sprinkle it evenly over the bottom of the pot. 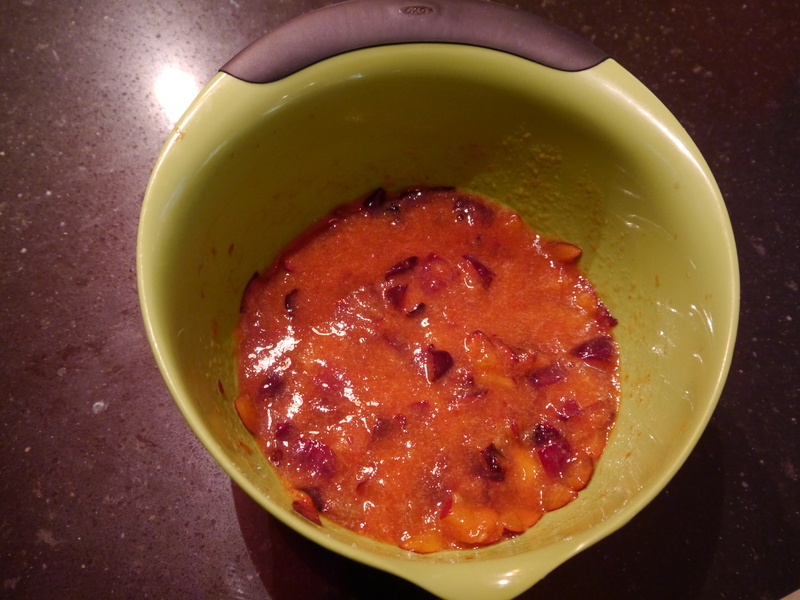 Transfer crushed plums into a pot, and add 1 tsp of butter. The butter helps reduce foaming. Press the jam button and increase the cook time to 30 minutes. After 4 minutes, slowly add the sugar while the jam maker continues to stir the plums, after the sugar has been added, put the lid on the jam maker. After 30 minutes, the jam maker will stop cooking and need to cool off. This is the one drawback of the jam maker, but for me it’s worth the wait to avoid manually stirring the jam! This recipe takes 60 minutes to reach gel stage, so I removed the bowl from the base, and allowed the jam maker time to cool. Once it cooled, I cooked the mixture for another 30 minutes. I recommend still testing for gel stage just to be sure the preserves are ready to be canned. I prefer the freezer gel test. 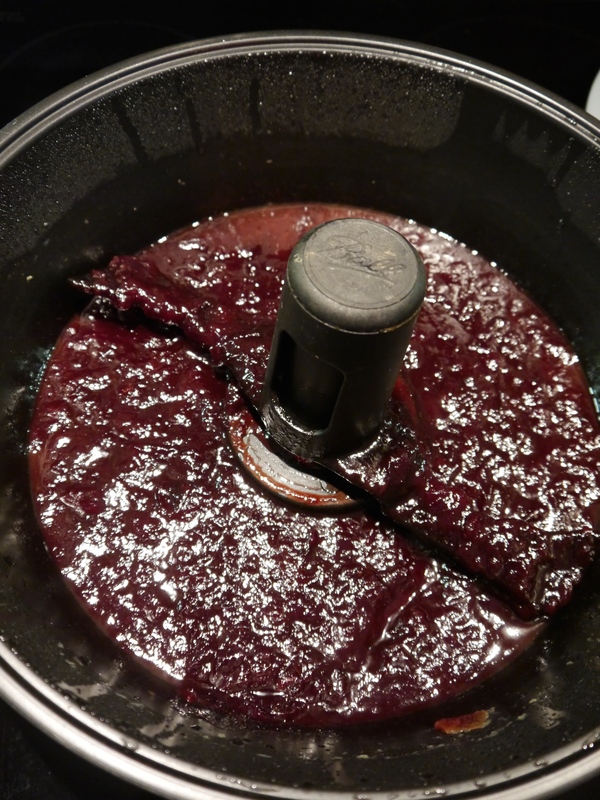 Remove pot from base of jam maker. 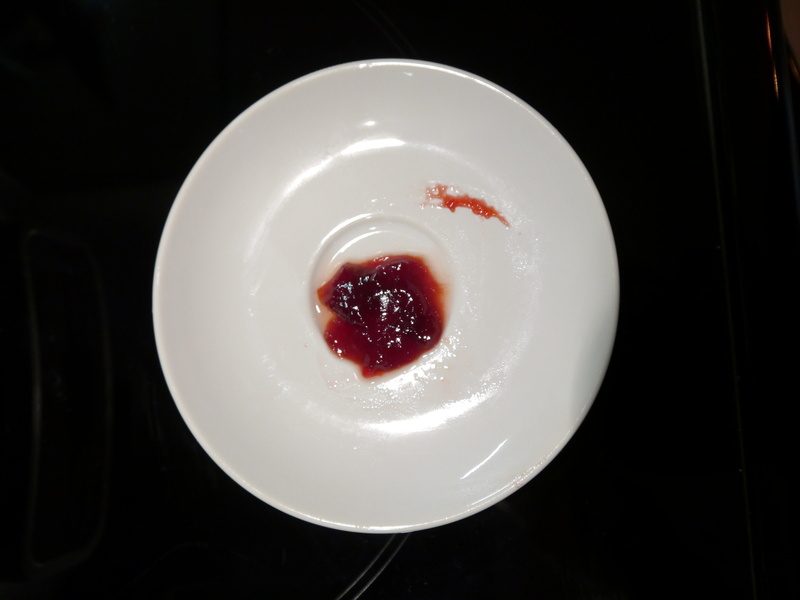 Place a teaspoon of preserves on a small saucer and put it in the freezer for 1 minute. Remove from the freezer and push the edge of the preserves with your finger. Preserves that have reached the gel stage will be set, and the surface will wrinkle when the edge is pushed. Once gel stage is reached, it’s ready to transfer to jars, and be water bath canned or frozen. Here’s a few pictures of the some of the process. The plum mixture after 60 minutes, I think it’s ready to add to jars! Last year, I used the water bath canning method because I had a much larger batch. I find the freezer method easier for small batches, here’s my freezer method instructions. Once you’ve achieved gel stage, use a wooden or plastic spoon to fill the jar size you’ve chosen and leave 1/2 inch head space. Apply the lids tightly and let preserves stand at room temperature for about 30 minutes. You’ll probably hear the lids “pop” which means they are sealing. Next, refrigerate the jars until they cool, and then transfer them to your freezer. I haven’t had any jars break yet using this method. Don’t forgot to label your jars! I like Ball Dissolvable Labels, they easily wash off in the dishwasher. I prefer to use eight ounce size jars or smaller. My favorite jar for preserves are the four-ounce, quilted crystal jelly jars. This size is perfect for gift giving! The finished product, Ready to water bath can, freeze, or eat immediately! 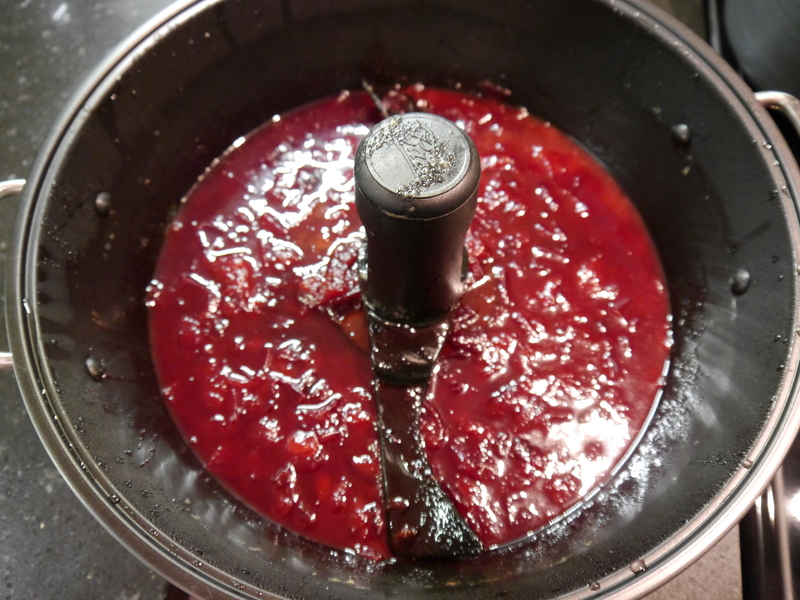 Transfer crushed plums into a wide bottom stainless steel or enameled cast iron pot. It’s important to use a non-reactive pot, Canning 101 explains why in this post. Add the sugar, butter, and pectin, if you’ve decide to use it. Bring the fruit to a boil over medium heat, stirring to dissolve sugar. Increase to high heat and boil hard, stirring constantly until the mixture thickens. Remove from heat, and test for gel stage. I found the gel stage is usually met after an hour of boiling. If your preserves haven’t reached gel stage after an hour, boil another 10 minutes, and check again. Repeat this process until the preserves gel. Once you’ve achieved gel stage, use a wooden or plastic spoon to fill the jar size you’ve chosen, and leave 1/2 inch head space. Preserve using either the water bath or freezer method. Now you’re all set to make your own plum preserves! Let me know if you try my recipe, and how you liked it! Categories: Ferments and Preserves, Recipes, Sweet Treats | Tags: Ball Jars, Canning, Japanese Plum, Plum Jam, Plum Preserves, Plums, Santa Rose Plum | Permalink.